Album Release Day: It's Here! 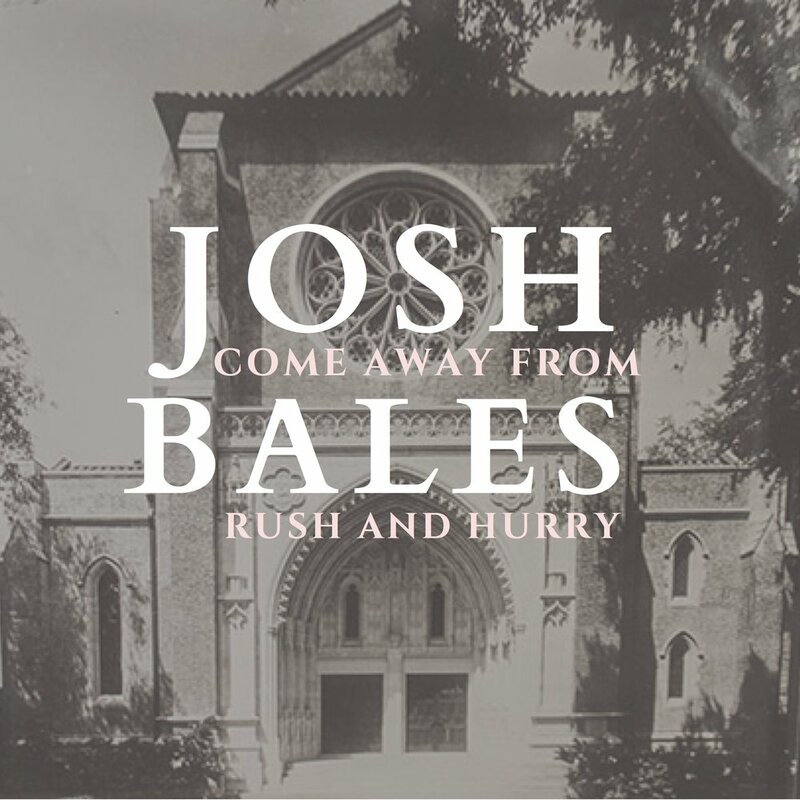 COME AWAY FROM RUSH & HURRY is here. 1. Share, share, share. Spread the word. Tell your friends. Gift the album to folks who might enjoy it but aren't familiar with my music. 2. Leave a review... whether you pick up the album from Amazon, iTunes, or Bandcamp, tell us what you think! This helps others know whether or not they'd be interested in downloading the music. Thanks for supporting my music, and this new project. (I'm already thinking about the next project). If you didn't listen to this music- I would still make music but- it would be no fun. So, your engagement, kind words, support, feedback, makes this part of my vocation so fulfilling. Thank you from the bottom of my heart. You can pre-order the album at Bandcamp right now, and check out a couple of songs while you're there. 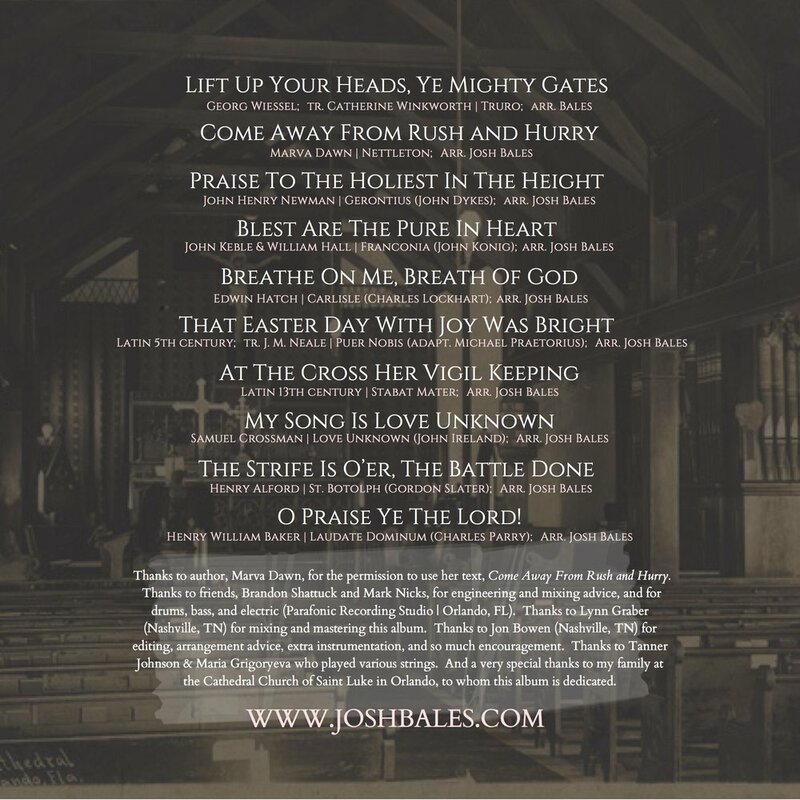 And please help me spread the word by sharing this album on your favorite social media feed! The renewal of daily prayer in the lives of every-day Christians “was one of the greatest successes of the English Reformation,” notes James White. It makes sense then, that in Anglicanism the laity, and not just the clergy, make vows to pray. Just as Bishops, Priests, and Deacons are asked some version of the question, “Will you be faithful in prayer, and in the study of Holy Scripture, that you may have the mind of Christ” in the midst of their ordination vows, so every Christian is asked, “Will you continue in the apostles’ teaching and fellowship, in the breaking of bread, and in the prayers” in the midst of their Baptismal vows. This article explores the topic of daily prayer in Anglicanism, its history and theology. The best way to examine this topic (as is true for any topic in Anglicanism) is to look at the Anglican liturgy found in The Book of Common Prayer. Particularly it’s the Daily Office (DO) liturgy, perhaps more than any other, that most clearly shows the importance of fixed daily prayer in the life of the Anglican Christian. First we will examine the history of the DO. And then we will discuss how the DO evidences three key components of the Anglican expression of Christianity: Lex Orandi Lex Credendi, Via Media, and the Threefold Rule of Prayer. The goal of this discussion? To help us pray. Dearly beloved, we have come together in the presence of Almighty God our heavenly Father, to set forth his praise, to hear his holy Word, and to ask, for ourselves and on behalf of others, those things that are necessary for our life and our salvation. In other words…the essential stuff, that’s what the DO contains. The DO is a rhythmic pattern and practice of scripture reading, praise, petition, confession, and thanksgiving, offered at fixed times each day. It includes some of Christianity’s oldest canticles (songs), and invites a wide-lens view of prayer (for self, city, and world). The thing is, as R.R. Reno poetically points out, “the Daily Office and its path into the mystery of Christ is far older and more reliable than Anglicanism itself.” That is, it’s a practice that began before Thomas Cranmer and the Protestant Reformation. It’s ancient- something that developed over many years in the undivided Church (the Church of the East and the West). In particular, fixed prayer finds its beginnings in Judaism and then in Christian monasticism. It continued to develop in local parish life up through the Middle Ages, and was given its current form in the days of the English Reformation. This is important: like all Christian doctrine and practice, the DO developed over time, guided by the Holy Spirit, in the life of the Church. "Seven times a day I praise you" the Psalmist says in Ps. 119:164. Prayerbook commentator Marion Hatchet notes, “By the time of Christ, the synagogue liturgy of the word [the Jewish equivalent to the Office) was conducted on at least some weekdays as well as immediately before the Sabbath meal.” While scholars debate which, if any, passages from the New Testament gospels evidence this handshake of fixed prayer between Judaism and Christianity, passages like Luke 4:16-30 seem to suggest that Jesus himself was familiar (and utilized?) some type of fixed schedule of prayer and scripture reading. In other words, organizing one’s day according to fixed prayer times was a part of the Christian faith from its earliest conception in Judaism. This is why, even today, as liturgical Christians follow the practice of the DO, they themselves invite the benefits of monasticism’s genius of prayer and work and community. Want to be a business man monk? Pray the DO. Want to include silence and scripture reading into the chaos of motherhood? Pray the DO. It wasn’t until the Reformation, with the printing press and the passion of the Reformers to place the scriptures back into the hands of the people, that the DO once again became accessible to the common Christian. It was the genius of…Luther and Cranmer, to see the potential advantage to the Church of making the Daily Offices a means of corporate worship for all the faithful…and, in particular, a vehicle for the recovery of the knowledge of the Holy Scriptures by all the people of God. In England, Thomas Cranmer took the historic Seven Offices used by the monastics, combined it with some of the Medieval traditions of prayer, included some Eastern Christian prayers and practices, and compressed those ingredients into two main services of Morning and Evening Prayer. The result? Anglicans have prayed some version of Cranmer’s DO ever since. In telling the story of the DO, it’s important to see that it has, like all aspects of the Church as living organism, developed and matured over time. None of the historic expressions of the DO should be shunned for this reason alone. Each in its time contributed to what we have today, and that lends to richness and depth. The liturgy of the DO in the Book of Common Prayer represents 2,000 years of Church history, theology, and practice. That is a true gift! In Anglicanism the DO reflects not only an historical Christian identity, but also an historical Christian theology. Three defining features of the Anglican theological tradition are put on display in the practice of the DO: Lex Orandi Lex Credendi, Via Media, and The Threefold Rule of the Church. Lex Orandi Lex Credendi means, loosely, the rule of prayer is the rule of faith. Liturgist Leonel Mitchell explains it this way: “[the] dependence of theology upon worship has been expressed in the Latin maxim lex orandi lex credenda, or more accurately legem credenda lex statuat supplicandi, which means that the way we pray determines the way we believe. In the Anglican tradition, dogma and practice flow from prayer, even as prayer flows from dogma and practice. This is precisely why Anglicanism’s primary document is a book of prayer, and not a catechism, or confession of faith. (Note: We do have a catechism and a list of article of faith, but these are both placed within a book of prayer…in the back). This feature of Anglicanism cannot be overstated. Unlike other iterations of the (Continental) Reformation, Anglicanism is NOT summarized in a confessional document. Nor is it summarized or defined by a Magisterium, as in Roman Catholicism. Instead, Anglicans believe what they pray. That daily prayer would be a vow made by every Anglican makes sense for this reason. The DO is fundamental to Anglicanism’s identity and theology. The second feature on display is summarized by the Latin phrase, Via Media, meaning, “the middle way.” This is the notion that Anglicanism is both Catholic and Reformed. Since the DO includes a great deal of scripture reading, it shows its Protestant heritage. But the DO also affirms the traditions of prayer through Christian history, utilizing forms and prayers that go back to the First Century. It’s Catholic! Put simply, in praying the DO, Protestants will feel at home. There is a lot of scripture reading. But Catholics will also feel at home (as will Eastern Orthodox Christians) when they sing the Magnificat or pray Saint Chrysostom’s Prayer. Anglican author Martin Thornton defines the Threefold Rule of Prayer as, “Mass, Office, private prayer.” These categories provide a helpful understanding for how the prior two Latin phrases work themselves out in Anglicanism. The Threefold Rule asserts that the DO is important, but only as it finds its place within the Christians canon of prayer: private devotion and corporate worship. The DO is one of three essential aspects of prayer in Anglicanism. In essence, the DO doesn’t stand alone. It is as strong as the Mass and Private Devotions surrounding it. The DO fits into this threefold expression of prayer the way the Holy Spirit fits into the Trinity. It works together with the other kinds of prayer to shape a whole Christian. The Anglican way of being a Christian is indissolubly linked with daily prayer, as evidenced by its book of prayers, particularly the liturgy of the DO. This isn’t new, or even 500 years old! It’s a practice rooted deep in the Church all the way back into the Old Testament. As such it has developed and deepened over time throughout the undivided Church. Roman Catholics and Eastern Orthodox Christians also pray a version of the DO (with some similar prayers!). I love this aspect of Anglicanism and pray this discussion inspires you (and me) to engage it more. James White, Protestant Worship, (Louisville: Westminster/John Knox, 1989), 103. Episcopal Church. The Book of Common Prayer and Administration of the Sacraments and Other Rites and Ceremonies of the Church : Together with the Psalter or Psalms of David According to the Use of the Episcopal Church, (New York: Seabury Press, 1979), 518. R.R. Reno, The Ruins of the Church, (Grand Rapids: Brazos, 2002), 151. Leonel Mitchell has a good overview of the history of the Office in Leonel Mitchell, Praying Shapes Believing, (Harrisburg: Morehouse, 1985), 37-39. James White, Introduction to Christian Worship, (Nashville: Abingdon Press, 1990), 124. Marion Hatchett, Commentary On The American Prayer Book, (New York: The Seabury Press, 1980), 89. Leon Morris, The New Testament and the Jewish Lectionaries, (London: The Tyndale Press, 1964), 14-15. In discussing Judaism’s role in forming Christian prayer James White posits what we may conclude at the very least, that while “Our knowledge of the Daily worship of the earliest Christians is meager…Apparently, a variety of Jewish customs of set prayers at set times had a strong appeal.” James White, Introduction to Christian Worship, (Nashville: Abingdon, 1990), 123. Marion Hatchett, Commentary On the American Prayer Book, (New York: The Seabury Press, 1980), 90. See also James White, Introduction to Christian Worship, (Nashville: Abingdon, 1990), 128. James White, Introduction to Christian Worship, (Nashville: Abingdon, 1990), 128. Massey Hamilton Shepherd, The Oxford American Prayer Book Commentary, (New York: Oxford University Press, 1950), 1. Phyllis Tickle, A Brief History of Fixed Hour Prayer, http://www.phyllistickle.com/fixed-hour-prayer. James White, Introduction to Christian Worship, (Nashville: Abingdon Press, 1990), 125. While no single source uses these phrases in precisely this way, see helpful overviews of each in the following. For Lex Orandi Lex Credendi see W. Taylor Stevenson, “Lex Orandi - Lex Credendi” in The Study of Anglicanism, ed. Stephen Sykes, John Booty, and Jonathan Knight, (Philadelphia: SPCK/Fortress Press, 1988), 187. Though a debated concept, the study of Anglicanism as a Via Media is best begun with John Henry Newman, The Via Media of The Anglican Church: Illustrated in Lectures, Letter, and Tracts Written Between 1830-1841, (London: Longmans, Green, & Co, 1891). See in particular John Henry Newman, “Via Media Vol. 1 No. 38” in Tracts For the Times, http://anglicanhistory.org/tracts/tract38.html. For a discussion on the Church’s Threefold Rule of prayer see Martin Thornton, Christian Proficiency, (London: SPCK, 1959). Leonel Mitchell, Praying Shapes Believing, (Harrisburg: Morehouse, 1985), 1. For a review of this aspect of Anglican identity that is as entertaining as it is informative, see John R. H. Moorman’s chapter “Golden Mean or Leaden Mediocrity” in John R. H. Moorman, The Anglican Spiritual Tradition, (Illinois: Templegate Publishers, 1983), 54-92. Martin Thornton, Christian Proficiency, (London: SPCK, 1959), 20. “The Nativity Of Our Lord and Savior Jesus Christ” Rublev. Lo! He comes with clouds descending, Once for favored sinners slain; Thousand thousand saints attending, Swell the triumph of His train: Hallelujah! Hallelujah! Hallelujah! God appears on earth to reign. If you're in the Orlando area (or nearby), I want to invite you to Sunday Nights At St. Luke's. 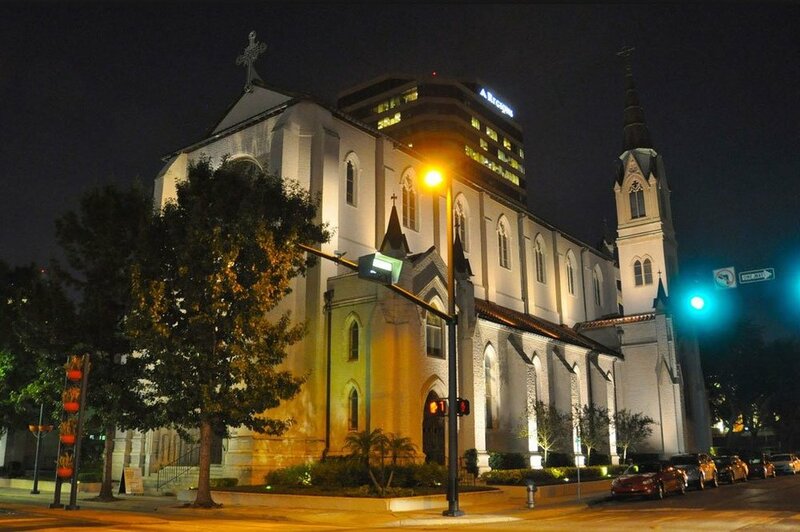 Each Sunday night in the heart of downtown Orlando, in a beautiful Gothic-revival style church called The Cathedral Church of Saint Luke, I lead worship for an ancient Christian service called Holy Eucharist. In songs and prayers, in scripture readings and preaching, we reenact the story of the Bible together: Creation, Fall, Redemption, Restoration. It's a worship experience that involves all five of your senses. You could say we even taste, smell, and touch the story in the bread and wine of communion. So from the architecture to the liturgy, as poet Gerard Manley Hopkins said, "Christ plays in ten thousand places." And it's glorious. 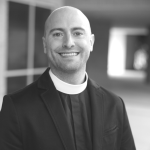 For more on Anglican liturgy and the Bible, HERE'S an article from one of the priests at St. Luke's, and my friend, Justin Holcomb. We meet each Sunday night from 6-7:15pm. 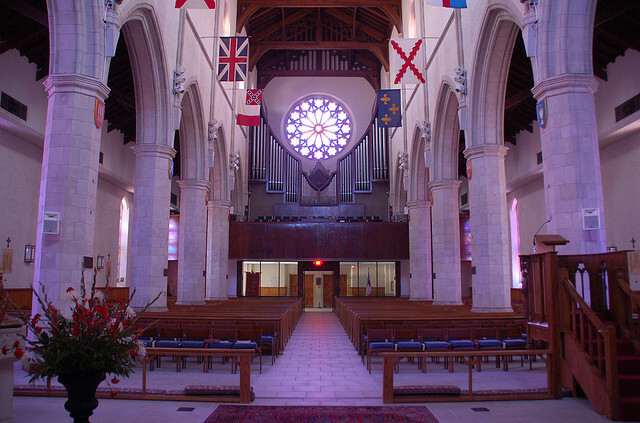 In Anglican churches some worshippers come early to kneel and pray silently in the Cathedral before the service begins. You are welcome to do this! After worship, we walk to a local pub for food, drinks, and conversation. Parking can be difficult in downtown Orlando. 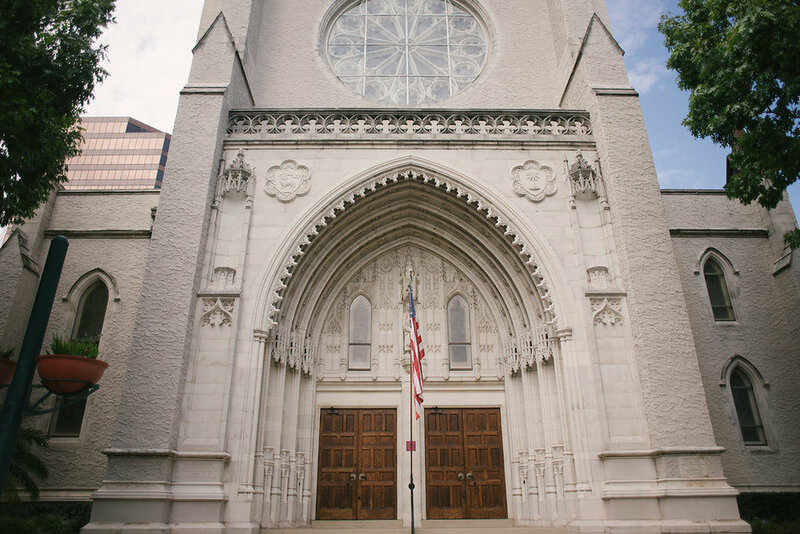 There are three good places to park when you come to the Cathedral: 1) Metered street parking around the building is free on Sunday nights, 2) The Lanier Parking Lot sits RIGHT BESIDE the Cathedral and parking is FREE there for those attending Saint Luke's, 3) The Regions Bank Parking Garage is another great free place to park. Pull into the garage, take a ticket, and get a parking voucher from an usher at the Cathedral before you leave. As you pull out of the garage put both tickets in the machine and that's it! Get more info on parking HERE. One of the great things about Christian worship in the Anglican tradition is that its liturgical style ensures that the gospel's proclamation isn't based on one pastor's personality or sermon. Nevertheless, God's church is led by imperfect men and women and we want you to know who they are! These folks have a steady role with us on Sunday nights. For a full list of wonderful staff of the Cathedral, go HERE.